I've got a guest blog for you today from Joel Marion of Cheat Your Way Thin. As I noted in a recent newsletter, Joel has done his homework, and in this article, he'll share with you some of the interesting research he's been doing over the last six years. Check it out: LEPTI-WHA?? It's name is Leptin (derived from the Greek word leptos, meaning "thin"), and it's without a doubt the most important hormone you probably never heard of. You see, leptin was only first discovered just over 10 years ago, and as far as weight loss is concerned, that's extremely recent. Leptin's function? To communicate your nutritional status to your body and brain. Leptin levels are mediated by two things. One is your level of body fat. All else being equal, people with higher levels of body fat will have higher leptin levels than those with lower levels of body fat and vice versa. Because leptin is secreted by fat cells, it makes sense that under normal conditions there is a direct correlation between leptin levels and the amount of fat you are carrying. Unfortunately, when you're attempting to lose fat and begin to restrict calories, conditions are anything but "normal" and the body responds accordingly by lowering leptin levels. This is because the second mediator of blood leptin levels is your calorie intake. Lower your calorie intake and leptin will fall, independent of body fat. So, yes, you can be overweight and still suffer from low leptin levels - just go on a diet. So what happens when leptin levels fall and why the heck does it matter? Again, under normal conditions leptin levels are normal and the brain gets the signal loud and clear that nutrition intake is adequate. Metabolism is high and the internal environment of the body is one very conducive to fat burning. Until you start dieting. Go on a diet and leptin levels quickly plummet (by 50% or more after only one week), sending a signal to the body that you're semi-starved and not consuming enough calories. This puts the breaks on metabolism and creates a hormonal environment extremely conducive to fat storage. Thyroid hormones (hormones extremely important to metabolism) respond by taking a dive and the abdominal fat-storing stress hormone cortisol skyrockets measurably. HELLO belly fat. And if that wasn't bad enough, the appetite stimulating hormones ghrelin, neuropeptide-Y, and anandamide all hop on board to make your life even more miserable. You don't have to remember any of those names, just remember that when leptin drops, you get seriously hungry. Despite having a pretty good reason for its reaction, it's pretty ironic that our bodies are primed for fat loss at every other time except when we are trying to burn fat. Wouldn't it be great if we could maintain high leptin levels and a body primed for fat burning while dieting? It would seemingly solve all of our problems. But in order to do this, we'd have to somehow keep leptin levels high as we attempt to lose those extra pounds. "HOW ABOUT "SUPPLEMENTING" WITH LEPTIN?" A couple of problems here: First, leptin is a protein based hormone, which means that it can not be taken orally (otherwise, it would simply be digested). So that rules out a leptin pill. This leaves the method of "supplemental" leptin administration to injection. And leptin injections DO indeed work, reversing the metabolic adaptations to dieting and "starvation" even while continuing to restrict calories. In 1996, Ahima et al. used leptin injections to reverse starvation-induced neuroendrocrine adaptations in mice. "Well, that's nice and all, but I'm human." Point taken; research with rodents doesn't always correlate to similar findings in humans, however... In 1999, Heymsfield et al. performed a double-blind placebo controlled study analyzing weight loss over a 24-week period in 73 obese humans. Subjects either injected daily with leptin or a placebo (i.e. bogus alternative). At the end of the 24-week period, the leptin group lost significantly more weight than the placebo and a higher percentage of fat vs. muscle. In 2002, Rosenbaum et al. administered low-dose leptin to subjects (male and female) who had dieted to a 10% decrease in body weight. During the diet period, thyroid hormone levels, 24-hr energy expenditure, and other metabolic markers substantially decreased. The result of the leptin replacement therapy? "All of these endocrine changes were reversed..." Thyroid output and daily calorie burn increased back to pre-diet levels. In 2003, Fogteloo et al. showed that leptin injections "tended to reduce the decline of energy expenditure associated with energy restriction, whereas the tendency of energy intake to increase back to baseline levels in placebo-treated subjects was largely prevented in subjects treated with leptin." Yeah, that's a mouthful. Let me put in simple terms: not only did the leptin group experience less of a decline in metabolism, but they were also less hungry, allowing them to more easily stick to the prescribed diet. In 2004, Welt et al. reported that leptin given to a group of women with thyroid disorder immediately raised circulating concentrations of the thyroid hormones T3 and T4. In 2005, Rosenbaum and company were at it again, again showing that energy expenditure and circulating concentrations of T3 and T4 all returned to pre-weight-loss levels with regular leptin injections. So, as theorized, keeping leptin levels high during a diet does indeed solve our dilemma by avoiding the negative metabolic (and perhaps behavioral) adaptations that calorie restriction perpetuates. The problem? Daily leptin injections are far too expensive, costing thousands and thousands of dollars per week. So, we can pretty much forget about supplemental leptin as a solution (which is probably moot anyway considering that not too many people are going to voluntarily plunge a needle into their skin daily). A REAL Solution Now that we know that leptin injections aren't going to save us, let's talk about the possibility of manipulating your body's natural leptin production. And I've got good news - this can indeed be done, and without involving needles or thousands of dollars. In fact, we'll swap the injections and mounds of cash out for two things I can guarantee you're absolutely going to love: more calories and more carbs. We know that leptin levels decrease by about 50% after only one week of dieting, but fortunately, it doesn't take nearly that long for leptin to bump back up with a substantial increase in caloric intake. In fact, research has shown that it only takes about 12-24 hours. So, the answer to the fat loss catch-22? Strategic high-calorie, high-carb CHEATING. By strategically cheating with high calorie foods (and yes, even stuff like pizza, ice cream, wings, cookies, burgers, fries, etc), you can give leptin and metabolism a major boost mid-diet which sets you up for plenty of subsequent fat loss when you resume your reduced calorie eating regimen. This means greater net fat loss week after week, and ultimately, a much more realistic, maintainable way to bring you to the body you truly want and deserve. So what's so special about carbs? Well, leptin, carbohydrate and insulin have been shown to have very strong ties. Calories alone don't get the job done, as research shows that overfeeding on protein and fat has little effect on leptin. In order to get a strong leptin response from overfeeding, there needs to be plenty of carbs in the mix. In fact, the relationship is SO strong that research conducted by Boden et al. at the Temple University School of Medicine shows that leptin levels will not fall even in response to all-out fasting so long as insulin and blood sugar are maintained via IV drip. That's CRAZY. Because of this carbohydrate/insulin-leptin relationship, it makes sense that foods combining both carbs and fat (like pizza, burgers, cookies, ice cream, etc) work best for reversing the negative adaptations caused by dieting because of the BIG-TIME insulin response they produce. THIS is why strategic cheating with your favorite foods is so powerful. THIS is why you truly can use your favorite foods to lose fat faster than you ever could with restrictive dieting. THIS is freedom. Essentially, it's everything "typical" dieting isn't. With regular dieting, come week two, you're screwed. With strategic cheating, you can literally use ANY food you want to *ensure* that you never go a single day without a body primed for fat loss. The cheat or not to cheat? I think the choice is clear. For more information on Joel's complete Cheat Your Way Thin system - available at half price through tomorrow (4/30) only, head on over to CheatYourWayThin.com. What the experts are saying about The Truth About Unstable Surface Training… “Unstable surface training is many times misunderstood and misinterpeted in both the physical therapy and athletic performance fields. The Truth About Unstable Surface Training e-book greatly clarifies where unstable surface training strategically fits into an overall program of injury prevention, warm-up/activation, and increasing whole body strength. If you are a physical therapist, athletic trainer, or strength training professional, The Truth About Unstable Surface Training gives you a massive amount of evidence-based ammunition for your treatment stockpile.” Shon Grosse PT, ATC, CSCS Comprehensive Physical Therapy Colmar, PA Click here for more information on The Truth About Unstable Surface Training. First off, it's a stretch for the hip external rotators, and the athlete is not bridging up. However, it's also useful to do the stretch in a more hips-extended position, as a small percentage of athletes will feel it more in that position. To perform this stretch, we'll do the exact same position, but have the athlete set up atop a stability ball (which keeps the femurs in a more extended position). Poor hip internal rotation range-of-motion is something you'll see quite frequently in soccer players, hockey players, and powerlifters, as all spend a considerable amount of time in hip external rotation. Likewise, I monitor this closely with all my baseball pitchers, as front leg hip internal rotation deficit is a huge problem for pitchers. When the front hip opens up too soon because of these muscular restrictions, the arm lags behind the body (out of the scapular plane). As such, it isn't uncommon for pitchers with elbow and/or shoulder pain to present with a significant hip internal rotation deficit. There is also a considerable amount of research to suggest that hip rotation deficits - and particularly, hip internal rotation deficits - are highly correlated with low back pain. There was a great guest blog post at Mike Reinold's blog recently that highlights all this research; you can check it out HERE. My personal experience with hundreds of people who have come my way with back pain overwhelmingly supports this "theory" (if you can even call it that). It's my firm belief that this is one of the primary reasons Mike Robertson and I have gotten so much great feedback on our Magnificent Mobility DVD from folks who have seen a reduction (or altogether elmination) in back pain. Teach folks to move at the hips (particularly in rotation) instead of the lumbar spine, and whatever's going on in their low backs calms down. Our goal is a minimum of 40 degrees of hip internal rotation. This is measured in the seated position (hips flexed to 90 degrees). In addition to the classes of athletes I mentioned earlier, we also need to watch out for hip internal rotation deficit (HIRD) in the general population because of what happens further down the kinetic chain. We all know that overpronation at the subtalar join is a big problem for a lot of folks. This can occur because of a collection of factors, from poor footwear (too much heel lift), to muscular weakness (more on this in a second), to mobility deficits (particularly at the ankle), to congenital factors (flat feet). To understand how pronation affects the hip external rotators, you'll need to listen to a brief synopsis of subtalar joint function... During the gait cycle, the subtalar joint pronates, to aid in deceleration. Basically, the foot flattens out to give us a bigger base of support from which to cushion impact, and from there, we switch back over to supination to get a rigid foot from which to propel. The picture below shows what our foot looks like when we have too much pronation. I figured I'd start up a mini-series of sorts here where I discuss some of the little changes you can make to programs to get big results. Many intermediate lifters get stuck in a middle ground with respect to heavy loading in their quest to build strength. Obviously, they know that, as a general rule of thumb, they need to use some heavier loading at least once a week in the 1-5 rep range to build strength. And, a lot of them (at least those who have read my stuff and other articles at T-Nation and EliteFTS) know that dynamic work - in this case, speed squats, deadlifts, and bench presses - is a great way to train bar speed and rate of force development - all while improving technique with submaximal weights. So, here you have two separate training sessions out of the week: one for maximal loading, and the other for speed. That said, a lot of these intermediates also are still new enough to the iron game that they can handle a bit more loading in the 85-100% range. With that in mind, I'll often plug in heavy "work-ups" following speed work. So, a lifter might do eight sets of two reps on the bench press, and then work up to a heavy set of 1-3 reps after those eight sets. This not only serves as a way to add in some extra volume in the traditional strength rep-ranges, but also allows a lifter to build in some testing to the program and continuosly monitor progress. I'll typically only do this 1-2 times a month, and as a general rule of thumb, it will come in a higher volume week that follows a lower volume week. So, in my high-medium-very high-low set-up, it would take place during weeks 1 and/or 3. For more strength building strategies like this at a great price, check out Maximum Strength. "When I wrote to Eric Cressey regarding online training, I had not lifted in over 3 months and my shoulder was gradually getting more painful doing everyday tasks. I had also consulted a physician about an MRI scan leading to the possibility of shoulder surgery. As a trainer, and someone who lives for the gym, I was pretty down about the whole situation so I decided to get expert advice. "The program Eric wrote for me was a real eye opener in regards to GPP, frequency of drills needed, filler drills between sets, and several other key concepts. I already knew most of the components of the plan but the recommendations made were different to what I would have programmed myself and it this gave me great focus for the prescribed four weeks. The program was detailed and the online support via email was excellent. "Just 30 days and 24 training sessions later, my shoulder feels better than it has in over two years, my strength is increasing with each workout, and the foam roller doesn't kill me anymore! Eric has changed my thinking about the importance and time given to warming up and targeted stretching to improve performance and I will always train smarter myself and with my clients in the future. Thanks, EC!" Nathan Williams - Bahrain ------------------------------------------------------------------------------------------------------------------------------------ "As a father of three active young boys and the leader of a growing business, I am not what you would consider an elite athlete; I won't be showing up on anybody's scouting reports for sure! I have been training long-distance with Eric since early 2007, though, and I could not have asked for a better coach. "Whether it's training around injuries, "pre-habbing" for a knee surgery, or just checking technique and answering my questions, Eric has always been available to me when I needed him and has been supremely responsive to MY needs as a client. It's difficult to express in such a short space how happy I am with Eric's services, except to say that I recommend him, unequivocally, to anybody I know who needs a coach." James Brandenburg - Bella Vista, AR ------------------------------------------------------------------------------------------------------------------------------------ "Eric has established himself as a well-known, top-level strength and conditioning coach for athletes. But, Eric is also an extremely gifted consultant for us 'mere mortals' who want to train sensibly while balancing family, business and other recreational activities into their schedule. After following several different weight training programs for many years without any significant improvements, I contacted him about one and one-half years ago and have not looked back. During this time, he has provided me with customized monthly programs that include mobilization, conditioning and strength training integrated into a time-effective and challenging program. "After diligently following his program, I can honestly say that at 51 years old, I am now the strongest that I have ever been while at the same time I have reduced body fat from 20% to 12%. Oh yes, this has all been done solely via email, as I live 8,500 miles away in Bangkok, Thailand! For anyone not fortunate enough to be able to train at Cressey Performance, I highly recommend his distance-based service." Randy Shaw - Bangkok, Thailand ------------------------------------------------------------------------------------------------------------------------------------ "In September of 2008, I visited Cressey Performance to work on a chronic shoulder issue. With the four high-profile powerlifting meets over a five-month period looming ahead, I sought out Eric's expertise to get me through them with minimal shoulder pain during the bench press. "Eric first assessed me and then gave me some viable alternatives to benching to keep me in the game. He made me realize I didn't necessarily need to just bench to maintain my strength. Eric focused on mobilizing and strengthening all the surrounding musculature, which directly helps with the lift. "The results speak for themselves, as I was able to go on to win two of those meets (AAU Worlds & USAPL Women's Nationals) and place second at Raw Unity Meet and third at the Arnold Classic! I am looking forward to continuing with Eric's program so that I can win USAPL Raw Nationals in July and IPF Masters Worlds in October. 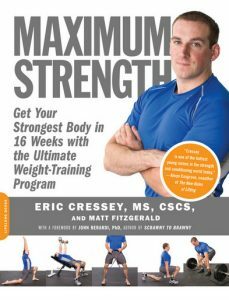 "For those of you whose training programs have stalled, or for those of you who have an injury that is preventing you from making any gains, I highly recommend a trip to Cressey Performance. If you can't make it there, work with him in an online consulting medium, at the very least!" Ellen Stein - Six-Time IPF Masters World Powerlifting Champion ------------------------------------------------------------------------------------------------------------------------------------ "I cannot thank Eric enough for the programs he has written for me. As an online client, I am 100% impressed with his ability to identify and address my weaknesses with fantastic results. Having been in and out of gyms for over 20 years, I can say without reservation that the work I have done under his guidance has crushed (performance-wise) everything else I have ever tried. Period. However, there is so much more to this than the numbers. My nagging shoulder is nearly a thought from the past. I am far more balanced and flexible and most definitely stronger! The foam roller work and mobility exercises have changed my ability to push hard. I also came to Eric in effort to gain strength and a better understanding of exercise technique. Thanks to this education and Eric's effective programming, after just 15 weeks, I am thrilled with my improvements on the bench press (40lbs), box squat (35lbs), deadlift (65lbs), and chin-up (50lbs) - and these numbers keep improving. These are numbers I have not put up since I was in college 28 years ago! I also found it incredibly motivating to send my training log in each week to get feedback. Eric's responsiveness to my e-mail questions and comments about my training log submissions are both timely and informative. If I were to talk to someone who was contemplating working with Eric, I would say the following: check your false pride and ego at the door, be prepared to train hard every session, be prepared to learn, and most definitely, look forward to getting results. BIG results. Paul Hellar - Duxbury, MA ------------------------------------------------------------------------------------------------------------------------------------ "After 25 years of extreme bodily abuse in the pursuit of a bodybuilder's physique, I decided to give corrective exercise a try. I came to Eric Cressey from across the U.S. after connecting with his philosophy and approach via his web articles. I immediately saw the genius behind the Cressey Performance approach to strength and muscle development and entered into an online consulting agreement. After eight months of training on programs authored by Eric, I have managed to correct flaws in my movement patterns and resolve several debilitating chronic ailments caused by years of improper form and overuse. He has helped this 40-year-old fix up a cranky knee, soothe ailing shoulders, eliminate low back pain, and become stronger in the process. I encourage anyone interested in exploring the absolute cutting-edge of exercise science to contact Eric right away and begin the journey towards a more intelligent and efficient way to build size and strength." Ray Bennett - Portland, OR ------------------------------------------------------------------------------------------------------------------------------------ "Working with Eric has been a very valuable experience for me. Prior to starting with Eric, I had spent the better part of two years not making any gains in the gym due to injuries to both my right shoulder and my lower back. Multiple orthopedists, physical therapists, and chiropractors only produced marginal improvements in my pain levels and most suggested I had made as much progress as could be expected without surgical methods. So after more than a year and a half of dealing with these injuries, I became desperate and began looking into my options for surgery. As a last resort before going under the knife, I decided to work with Eric after reading through some of his online material. This turned out to be the best decision I could have made. After the first four weeks, I noticed significant improvements in my pain levels. Now, several months later, I am injury-free and able to push myself in the gym without the fear of getting hurt again. I am setting personal records on a regular basis, learning a lot, and finally making gains once again. And all along, Eric has been very supportive, very informative, and more than willing to answer my many, many questions." Danny Ferrari - Washington, D.C. ------------------------------------------------------------------------------------------------------------------------------------ "Over the past eight months I have been an online client of Eric's, and most recently completed the Maximum Strength program. I originally sought Eric's assistance after experiencing a chronic overuse injury of my rotator cuff, as my shoulder was simply breaking down due to excessive isolation exercises and overtraining in my years of lifting. Eric provided an individualized program that not only rebuilt my entire scapular region in five months, but provided the foundation from which to excel in his Maximum Strength program. "At the conclusion of Maximum Strength, I surpassed 1000 lbs as my combined total on the squat, bench, and deadlift despite never training for strength in the squat or deadlift prior to the program. My shoulder is now stronger than any time in the past. The focus on my posterior chain has enabled me to achieve personal records in all pressing and pulling exercises at the age of 38. I simply train with more weight than ever before. After 20 years of training with an emphasis on isolation, I have never experienced the rapid success, health, and strength in the eight months I have worked with Eric and his programs built around strength and mobility. Eric is an incredible coach capable of communicating to clients at all levels of development." Maurie Munro - Colleyville, TX ------------------------------------------------------------------------------------------------------------------------------------ "I have been working with Eric for years now. When I started, I was coming off a serious knee injury, which was preventing me from running. A few months later I was pain-free and back to regularly running. Eric understands, in light of the most recent research, how strength and speed training fits with endurance training. I particularly like the fact that, although the program is clearly running-focused, it takes the weight-room and mobility components just as seriously. You will not find yourself doing a few bicep curls after monotonous days of long, slow distance running. You'll be doing intervals and deadlifts, getting stronger and, therefore, faster, with fewer injuries." Sean Thompson - New York, NY ------------------------------------------------------------------------------------------------------------------------------------ For more information on Eric's online consulting services, please email ec@ericcressey.com. Q: My son pitches for a Division II baseball program - well, at least, until recently. Since he began his strength training regimen one year ago, his pitches have gained velocity, but he no longer has control over the ball. Is it possible that his training has changed the mechanics in his arm so much that he has no idea where the ball is going after it leaves his hand? He's frustrated - we are talking about one of the best and strongest in collegiate baseball and now they won't even put him on the mound. I asked some baseball veteran friends about it and they suggested he has to retrain his arm since he has become so much stronger. What are your thoughts? A: I've definitely seen guys who have gained muscle mass and lost velocity because they didn't train the right way, and it can absolutely go in the opposite direction as well and affect control. I agree with your pitching coaches that he probably needs to retrain his mechanics with the added weight, but to be honest, it's something that should have been happening with a gradual weight gain anyway. I would be more inclined to look to address any range of motion (ROM) deficits he may have acquired through the process of gaining weight. For instance, if he lost some hip rotation ROM, it could markedly affect control. A guy without enough hip internal rotation will fly open early on his front leg and, as a result, the arm lags behind (and out of the scapular plane, which can also lead to arm problems). A guy who loses external rotation tends to stay closed, which means he either throws more across his body (increased arm stress) or miss high and inside frequently (in the case of a RHP vs. right-handed batter, or LHP vs. left-handed batter). Likewise, a pitcher who bench presses until he's blue in the face can lose both external rotation and horizontal abduction ROM. These ROM factors are two (of many) predictors of velocity, and while a decrease in one or both normally equates to a drop in velocity, it could also cause a pitcher to change his arm slot. I actually wrote more about this in an old newsletter: Lay Back to Throw Gas. These are just some thoughts. I'd need to do some ROM tests and see some videos of him throwing to know for sure if any of my impressions are on the money. For more information, I'd definitely recommend you check out the 2008 Ultimate Pitching Coaches Bootcamp DVD Set. Sign-up Today for our FREE Baseball Newsletter and Receive a Copy of the Exact Stretches used by Cressey Performance Pitchers after they Throw! The medicine balls in question can be found HERE. 6. I've written quite a bit in the past about how a glenohumeral internal rotation deficit can be one contributing factor (among others) to medial elbow injuries in overhead throwing athletes. The other day, someone asked me if I had any scientific evidence to support this idea. The answer would be a resounding YES. Very simply, if you lack internal rotation, you'll go to the elbow to "regain" that lost range-of-motion. It's the same reason that ankle mobility deficits can lead to knee pain, and hip mobility deficits can lead to knee and lower back pain. 7. I don't really "get" how this whole Delicious bookmarking thing works, but Jon Boyle (who helps out with the blog) recommended I start sending him recommendations of good stuff I've read. You can find some of my recommended reading/viewing off to the right-hand side of the page. If there are books you recommend I check out, by all means, please post suggestions in the comments to these blogs; I'm always looking for new reading material. Just a quick reminder that there is less than four hours remaining on our 15% off sale this week. Click here for details. I got this email over the weekend from a recent finisher of the Maximum Strength Program: "Eric, Here are my results on the Maximum Strength program. Packing Day Standing Broad Jump: 80 inches Bench Press: 225 lbs Box Squat: 295 lbs Deadlift: 385 lbs ------------------------ 905 lbs total for the big 3 3-Rep Max Chins: BW (230) +10 lbs total of 240 lbs ------------------------------------------ Moving Day Standing Broad Jump: 90.25 inches (+10.25 inches) Bench Press: 275 lbs (+50 lbs) Box Squat: 365 lbs (+70 lbs) Deadlift: 405 lbs (+20 lbs) ------------------------------------------- 1045 lbs total for the big 3 (+140 lbs) 3-rep Max Chins:BW (220) +35 lbs total of 255 lbs (+15 lbs) "Thoughts on the program: "This is the first program I have ever completed from start to finish in the few years that I have been lifting. I always got burned out or got training A.D.D. and did something else. Not with yours. "This program was incredible. Not only did it feel great to do a specifically designed program, but it felt great to see my progress as I was doing the program. The gym I worked out in didn't have a power rack-only a squat rack- so I had to do some McGuyver rigging for rack pulls and pin presses. I wasn't able to do the Anderson Front squats and had to go light on the floor presses, but all in all, I was able to stick with the program 100%. "I missed about a week total of workouts due to a couple serious, family emergencies, but I didn't use that as an excuse to fall off the wagon. I pushed through and loved my results. "Thanks for such a great program, and I look forward to the sequel. "David" 5o pounds added to a bench press in 16 weeks? Not too shabby! Click here to purchase Maximum Strength for yourself! To kick off the week, I thought I'd give you a quick heads-up on some stuff you ought to read: What Your Doc Doesn't Know About Weightlifting - This great piece is from Nikhil Rao, an avid weight trainer who also happens to have recently become a doctor. He shares some excellent insights about how prepared your doctor may (or may not) be to give recommendations to you on exercise and nutrition. The Proactive Patient - Along these same lines, it'd be worth checking out this article I wrote last year. It talks a lot about things you ought to consider if you're injured and want to get the best care possible. I've actually got something good in the works along these lines right now, and should be submitting it at T-Nation by the end of the week. The Indianapolis Performance Enhancement DVD Set - I previously wrote a review about this product HERE, but it seemed like a good idea to give it another mention since it's on sale at 15% off through the end of the day Thursday. Just use the coupon code "HITCHED" at checkout.